In Louisville, many Jews turned out at a vigil at Jefferson Square Park on Saturday afternoon, March 16, joining hundreds of others from all faiths, or no faith at all, to show their solidarity with the Muslim community. 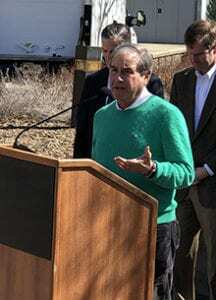 U.S. Rep. John Yarmuth, told the crowd they had all attended “far too many vigils” and he had run out of things to say. So he read a letter written by South Bend, Indiana, Mayor Pete Buttigieg, to his city’s Muslim community, which the congressman said reflected his feelings. Other Jewish leaders attended the vigil, including Jewish Community of Louisville President and CEO Sara Klein Wagner and Rabbi Joe Rooks Rapport of The Temple. The JCL issued a statement shortly after news of the New Zealand attacks Friday. • The Levine Center to End Hate and the Jewish Federation of Greater Rochester organized members of the Jewish community to stand outside of the Islamic Center of Rochester on Sunday to show support and solidarity, including with messages on handmade signs. • Two Cleveland-area rabbis were scheduled to speak Sunday at an interfaith vigil for peace and understanding organized by the suburban Chagrin Valley Islamic Center. • San Francisco’s Bay Area Jews attended prayers on Friday afternoon at several mosques, with Jewish groups encouraging their members to attend. • The New York Jewish community joined hundreds of fellow New Yorkers who gathered at Washington Square Park for an interfaith prayer session and vigil. The event was moved to an earlier time to allow Sabbath-observant Jews to attend. • In Great Britain, a Labour Party lawmaker called for action against a neo-Nazi radio station called Radio Aryan, which broadcasts anti-Jewish and anti-Muslim hate.